NASA has been in meetings behind closed doors with two top tour companies. Last week there was leak that these secret negotiations centered on NASA's desire to put a colony of people on the moon or on Mars. Our source says that NASA wants one company to split the cost of setting up the colony, and in return the company will get fifty percent of all profits made from the colony and from tours to the colony. NASA has the funding to start a colony on only one of the destinations, so the tour companies are said to be trying everything to sell their proposals. One of the companies is called Elite Tours and their motto is "Tours for those who have already been there-done that, and want more." They are selling the moon as the perfect place for a colony and tours. The other company is called Excursions and is known for conducting tours to the North Pole, tops of mountains, under the sea, deep within rain forests, and far into the Australian Outback. Excursions is selling Mars as the perfect place to set up a colony and tours. However, since the leak, Congress has had several complaints from taxpayers about spending their tax dollars on space exploration and colonization. The government has been forced to address the complaints. In a late-breaking press release Congress said that they would allow each tour company to make a presentation. The presentations determine not only which place will be colonized, but whether there will be a colony at all. State the benefits of space exploration and colonization. Describe the characteristics of your destination. Describe the feasibility of exploration and colonization of your destination. Compare and contrast your destinations characteristics with the characteristics of the other destination. Compare and contrast the feasibility of exploration and colonization of your destination with the other destinations feasibility. Which team will win over Congress? Will we be creating a colony on the moon? On Mars? Or will there be a colony at all? 2. Once you have formed your team, divide your team evenly into five groups to complete specific roles. Completion of the groups roles will help to build your teams presentation. To discover the roles, click below on your specific team. 3. After the groups have completed their roles, each group should share their findings with the team. Then your team will use the groups findings to create a persuasive power point presentation. Finally, your team will show your power point presentation. Good Luck! Hint for the proponents of the moon: Information about the moon will often be found under the main heading, planet Earth. This site offers an educational tour of the solar system. It provides photographs, scientific facts, text, graphics, and videos. This site offers all past, present, and planned missions to both the moon and mars. University of Arizonas review of the planets. A lot of great pictures, facts and historical data. This web site is specifically for children, created and maintained by NASA. Make sure your choose Level 2 on the left side of the main page. An incredible space web site run by the University of Michigan. It has general information on the planets, space missions, people, planet myths, and much more. You can go to the table of contents by clicking on "Enter this site" on the main page. There are three levels of difficulty. You probably want to start on the intermediate level. If that is too difficult, click to beginners. If intermediate is too easy, click to advanced. Cal Tech run web site for NASA and Jet Propulsion Laboratory. 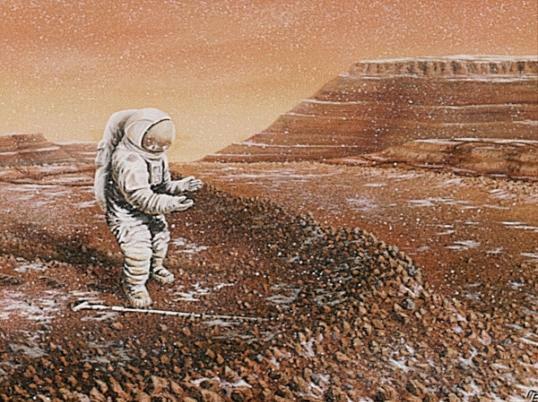 This site offers many photos and descriptions of the terrain and explorers of Mars and the moon. It also gives a brief profile of Mars. Although this site is specifically geared to free-floating space stations, it answers basic questions about space exploration and colonization: who, what, when, how, and how much. This site discusses basic human needs from atmospheric needs to energy needs. Click on Mars on the main page. This site gives general information and asks insightful questions as to why Mars would be a good destination. It also gives background information on Mars. This site offers current news, basic information, and images of Mars. Encarta Encyclopedia  This gives very basic information about the moon and Mars. UXL Science  This CD gives more specific information on the destinations. Welcome to the Planets  This is CD is by NASA and Planetary Data Systems and gives 190 selected space images with explanations. To find current magazines articles on your destinations, access ProQuest Direct through your computer. To locate books in libraries other than our own, access ACCESS PA through your computer. Self Evaluation  You will evaluate your participation with the participation rubric. and the average of their scores will be your group evaluation score. Click here to see the participation rubric. Content - Click here to see the content rubric. Technical Quality  Click here to see the technical quality rubric. Congress is very impressed with all that was in your presentations. Your understanding of the benefits of space exploration and colonization has persuaded Congress to allow NASA to go ahead with their plans. Congress is still considering all the facts and comparisons you shared about the two destinations characteristics. After they review and discuss the facts, they are going to make a decision about which destination should be chosen. However, they have one question that they would like you to explore and answer in the near future. They wondered if any of the outer planets would be suitable for space exploration and colonization. This webquest is meeting the standard for students to be able to "Discern essential ideas about the composition and structure of the universe and the Earths place in it." Click on POINTS to see an easy way to determine a students point allocation using the evaluation rubrics.